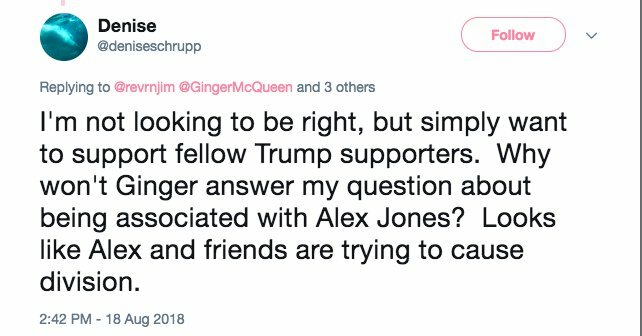 Thread by @GingerMcQueen: "In case you missed it, you'll want to be up to speed on the fraud around Qanon to understand what is coming. They don't want you to know tha […]"
In case you missed it, you'll want to be up to speed on the fraud around Qanon to understand what is coming. They don't want you to know that hundreds of thousands of dollars have been made. They pretend it's just innocent research, so let's dive into what is really happening. The first day that the Q app was released, they made $10,000 on the app alone. The Tracy Diaz mentioned in the NBC article is known as Tracy Beanz on Twitter. 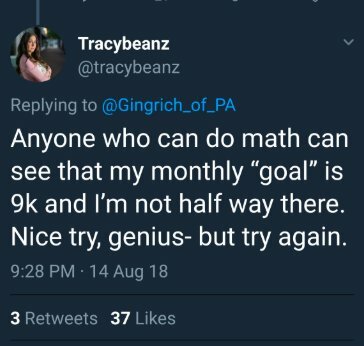 When confronted by @Gingrich_of_PA, she admitted that her Patreon goal each month is $9,000, but she is "only halfway there." Who in their right mind expects to be paid $9,000 a month for tweeting? Another mentioned is Pamphlet Anon, who has been busted on his own live stream posting as Q. Here, he says that Q forgot to sign in as Q and posted as a regular anon. If Pamphlet wasn't posting as Q, how would he know that was supposed to be a Q post? In addition to apps, Patreons, and PayPals, there are monetized YouTube channels. Some of these people are taking bitcoins. They call themselves, "bakers," because they interpret Q's breadcrumbs. They are making thousands upon thousands of dollars from people who just want hope. They didn't stop there. They've made the same claims about Scott Adams. They say he and others are being paid with money from H.R. 5181 to counter foreign propaganda to keep the truth suppressed. 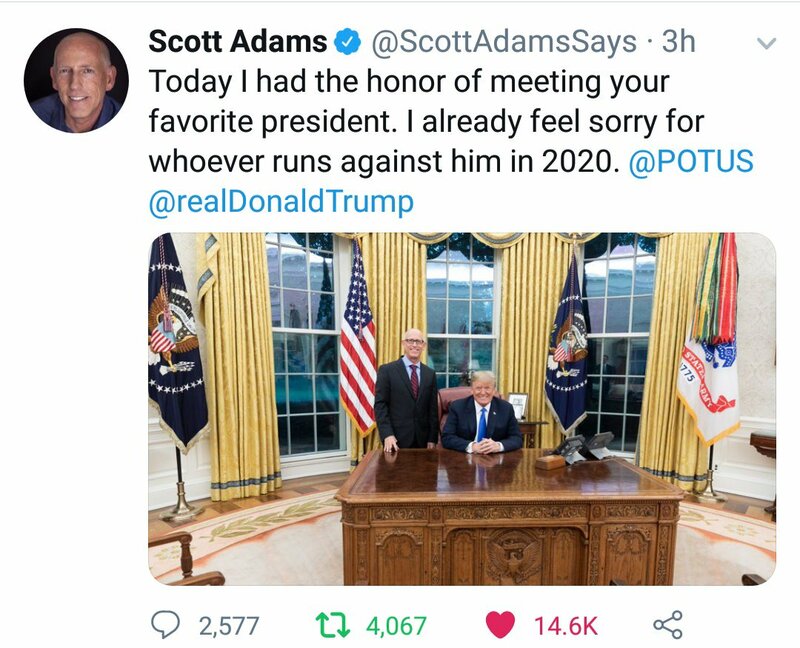 Pay no attention that Scott met with Trump before his series outing Q. A lot of people have been working to get the truth out there for a long time. @Gingrich_of_PA, @Fulcrum__News @antischool_ftw, @UNIRockTV, and many others. This is a good video by two of them explaining what is going on. Q was hacked on August 10th. A nice letter was written to the followers asking them to refocus their energy elsewhere, but scammers gotta scam, so they regrouped and continue to post. 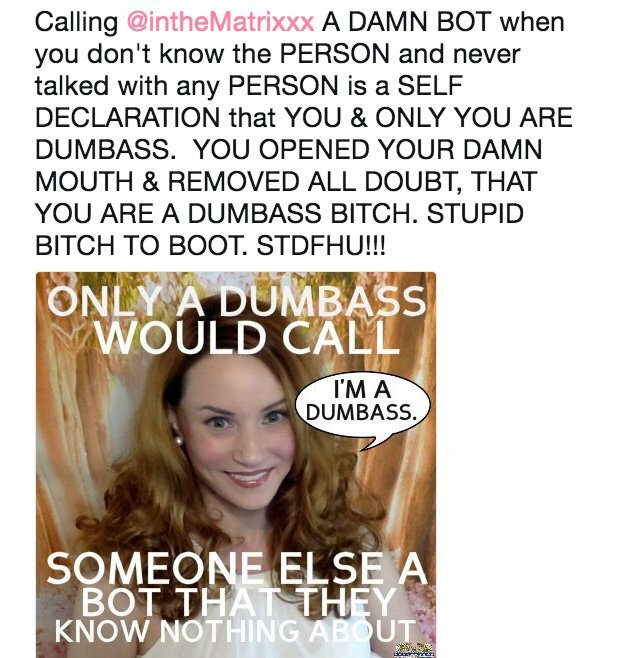 One of the hubs is @inthematrixxx. He took a swipe at me, so I decided to figuratively kick the nuts of the hub on a scope to see what would happen. It was like playing fetch with a puppy. I baited you and you did not disappoint. What you've seen on my timeline the last few days has been the swarm of attacks that they use to try to shut down people who dare to speak out. (They aren't sending their best, folks.) They try to overwhelm people until they go away. They weren't your run-of-the-mill Q followers. What is interesting is their desire to tie me to @RealAlexJones. They're on The Great Awakening talking about how it's part of "the plan," to shut Alex down. There is a video of Pamphlet saying that he will be bigger than InfoWars. Remember the name James Brower. That name will come up again this week. Q was passed off. I say this in past tense because Q will be roasted like a turkey on Thanksgiving. Stay tuned because more is coming! We have seen the tip of the iceberg. Who else is involved, how did they get involved, and why? Thanks to @Carpedonktum for that gif. It didn't attribute it to him. If you aren't following, he's an absolute genius. 1. Register as a Republican. This is important because in many states you cannot vote in primaries to get a better candidate on the ballot in the general election. 2. If the candidate you preferred did not win in the primary, vote for the Republican who won because majorities are needed to pass legislation. Majorities also determine committee chairs, thus what is determined salient. 3. All legislation begins in the House. A bill passes the House and moves to the Senate if it receives 219 votes because that is more than half of the 435 members. 2) #Qanon posted a link to 2 news articles. 3) The first article is about the revelation that China was receiving (in real time) Hillary Clinton's emails. The @petestrzok gofundme page was started ~6 hrs ago and has nearly $60k in donations. Does anyone find that suspicious? Notice how people with political allies end up getting gofundme pages that funnel tens or hundreds of thousands of dollars to them. As of now, the campaign is close to $170k with nearly 4200 donors. Coincidentally organized by: "Friends of Special Agent Peter Strzok"
By far, top raisers are the resist-Trump Krassenstein twins. Same Krassensteins of Fort Myers raided by Feds in Sept. 2016. Feds raided the Krassensteins while "investigating a $500 million fraud ring being run by an organized crime syndicate in Russia" they thought the twins were "key" players of. 2/ MAX SANDLIN is general counsel at MERCURY. He was a DEMOCRAT CONGRESSMAN from 97-05 in TEXAS. He worked extremely closely NANCY PELOSI. 3/ MAX SANDLIN married STEPHANIE HERSETH in 2007. HERSETH was also a congresswoman while involved with SANDLIN. HERSETH voted for legislation SANDLIN was lobbying for. Today, both are lobbyists.